You don’t expect to meet A-list celebrities where I am from. I live in a historic, little town with a hip vibe in the South of England but it is still far removed from the glitz of Beverly Hills. On this particular night I was out at a funky, local bar with a medley of social circles. There were several people amongst these groups of friends that I knew very well and there were some that I had only met that night (a point that becomes significant later on in this story). It was a jovial evening and spirits were high. El vino was flowing and the laughter was boisterous, but all the discussions had turned to focus on a glamorous maiden nestled away in the corner of the crowded bar. It didn’t take long for people to start recognising who she was… it was only EMMA WATSON, star of the world famous Harry Potter movies! My friends, knowing what I do for a living, were already goading me to go and approach her. I was up for the challenge, although I had to make a conscious effort not to let the awe of the situation get to me. It was a live music night in the venue, loud and busy, so as I was strolling across the room I knew I was going to start with a low-committal and high-compliance conversation starter. This type of conversation starter is anything that prompts a socially polite response, where you are unlikely to get a rude or dismissive reaction. Emma and her friends turn to face me. “Err, we know the organiser,” her tall, male friend nonchalantly replied. As I continued, I moved slightly to position myself more directly alongside the group. This seemingly insignificant action changes the dynamic completely as I now become observably part of their group rather than an outsider, a stranger. This short exchange had warmed me to the group so I introduced myself, “I’m Sam, by the way,” as I held out my hand to greet my new friends. Even though I already knew who I was speaking to, a flutter darted across my chest as she responded with a warm smile, “I’m Emma.” I snapped back to reality and composed myself. After all, my main focus of the whole interaction was to treat her like the normal person she is, beneath the glamorous, celebrity shell. I proceeded to teach Emma an overly elaborate and comical handshake, dressed with various clicks, flicks and slaps. She absolutely loved this little routine and it was definitely starting to set me apart from most of the people she meets. “How do you all know each other?” I asked. “We’re in a relationship together,” replied her tall friend Jay, motioning between himself and Emma. Prior to this revelation I had an assumption that they might be a couple. This didn’t change anything. I would never disrespect someone’s relationship and I was simply enjoying making friends. There were other people around Emma now so I turned my attention towards her boyfriend Jay. We had a brief chat about where he is from and what he does etc. It was very basic conversation but I was definitely warming to this guy and I could see why he had wound up dating a celebrity megastar. After a few minutes, I glanced over at Emma and she looked like she was feeling slightly excluded. “I have an intuition about you,” I mused in her direction. I turned back to Jay: “Do you mind if I borrow Emma for a second? We’ll just be over there,” I said, pointing a few feet away towards some chairs. He had other friends around him so I knew this wouldn’t be a problem. Emma and I stepped to one side. I can’t remember my exact words during these few minutes in private with her but what I was basically doing was explaining some simple intuitions I had picked up about her during our limited interaction so far. This is something I’ve become very skilled at from years of studying social psychology and is far more casual in practice than it sounds. I was enjoying getting to know Emma a bit better and for a brief moment her celebrity status had been washed away. It felt like I was getting to know the real her, beyond what the cameras see. Craig was a quiet but pleasant guy with blonde, shaggy hair. I had been introduced to him at the beginning of the night, several hours ago, but had barely spoken to him since then. This is what made the next few moments even more of a surprise. As amusing as this scene must have looked to everyone around us, I could sense the instant unease amongst Emma and her friends, so I decided the best course of action was to politely drag my acquaintance away. As we headed back to our friends, Craig seemed blissfully unaware of his social faux pas and was still noticeably excited that we had a celebrity in our presence. I rejoined my friends and was hit with a barrage of questions about everything we had talked about. I dismissed Craig’s little cameo from my mind; I had Emma’s phone number after all, so I could speak to her again regardless. He proudly presented me with a crumpled napkin like a king being bestowed his crown for the first time. 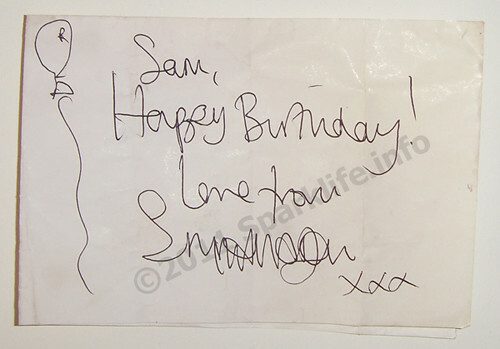 I unfolded the napkin to reveal a scrawled message written and signed by Emma Watson. I glanced over and saw Emma and her friends leaving the bar. Craig had unwittingly transformed me from a cool guy she had met randomly… into another obsessed fan of hers! So what happened with you and Em? Did you Talk to her again that night? Did you ever texted her? I really want to throw this Craig dude into a volcano. I loved the story, and I really hate it when a friend messes up my plans even if he does it unintentionally… 🙂 Did you ever speak to Emma after that encounter? As surreal as the interaction might have seemed at the time, she was actually incredibly normal and very friendly. I’ve met other celebrities and she seemed a lot more down to earth and humble than some of them. Have you ever considered if Craig was trying to get between you and Emma? Was he legitimately trying to help you by telling her you were a fan? Maybe he was intentionally tarnishing your reputation with her. I had considered the possibility of him intentionally sabotaging the interaction but I really do think it was just a misunderstanding. He was very drunk and hadn’t seen the majority of my interaction with Emma. Although he didn’t seem to think he had done anything wrong, he must have sensed that I was annoyed immediately after we had left the group. Getting the autograph seemed like a genuine attempt from him to do me a favour or make amends. I’ve spoken to Craig a few times since the incident and he is a genuinely nice guy. This is a great story and I got a lot out of reading it. I would love to be this solid and cool around normal women let alone hot celebritys. I’m sure there are more details and stuff going on inbetween the dialogue you wrote out but how did you get her on her own and her number so easily? I’m pretty sure she would have told me to get lost if I tried this lol. Also looking back at it all, do you think you could have done anything differently so your friend didn’t mess it up so badly? Thanks for a great read, I just signed up for your website updates. My main goal when speaking to any new group of people is always to befriend everyone and make sure I never come across as a threat or weird in any way. Once you have established those roles, it is actually very easy to guide the interaction in whatever way you want by being leading and assured in your actions. Note how I confidently instigated each small step of the interaction rather than asking for permission or seeking approval. The whole interaction was longer than the above recount perhaps suggests but the omitted details were just standard conversation filler and building rapport. It all seemed very natural at the time. With regards to the second part of your comment, I have thought about how I could have handled the situation better when Craig joined us but I am not sure I could have, as it was completely unexpected. I can think of a few friends of mine who would have instinctively been able to help me out but they weren’t with me that night. Thanks for sharing such a cool story regardless of the outcome. It made me smile. Ok, it didn’t have the ending that you imagined, but from where I sit, it’s really realistic. Your acquaintance may have been the shy type and actually drank a bit to get the courage to approach her, especially if he barely said a word to you all night. He probably was kicking himself in the morning too, unless he never gets embarrassed about anything. His actions are something I wouldn’t think twice about. It was beyond your control. You never know, you may bump into her again and this will all be a passing memory. I don’t know about calling though. If the desire to talk to her is genuine and you’re good with leaving messages, then I would say why not? However, I wouldn’t expect much in return because it happened a while ago. I would think after time has passed and if she thought about it, she would believe the guy who struck up a genuine conversation with her as opposed to the one who had a little more to drink than he should have. You make some great points and I love the way you summed up your comment about being fearless and learning from experiences. Making genuine connections with people is a very learnable skill, and you can only perfect it by practising talking to as many different types of people as possible. I thought that Emma or any other celebrity would never give her phone number to an unknown person, so you might have transmited her confidence… Even I (a normal person) wouldn’t give my phone number! Believe it or not I’m sure from time to time she still either talks of you as in “There was this one time…” If not then who cares, you met and actually got to “hang out” with Emma, something a lot of people in this world would kill for! Not only that but you played it very cool, the whole handshake thing was definitely the “Breakaway” point if that makes any sense. That point from awkwardness to her seeing you generally just wanted to converse as a human being and not as a crazed fan. Kudos to you dude, well played and correct me if I’m mistaken but just taken out of context, you’re a psychic? Great story by the way, really enjoyed it. What you said makes a lot of sense and I agree with your points. The main thing I teach when I do dating coaching is to basically be different or ‘more interesting’ than every other guy. This is especially important when approaching and interacting with celebrities or other people with highly perceived social value. I’m not sure what led to the psychic remark. I don’t do anything psychic in the sense of anything supernatural, but social intuition and being able to read peoples micro-expressions and non-verbal communication does bear some resemblance. In fact, along with things such as cold-reading, they are the very techniques that proclaimed psychics use to give the illusion of supernatural ability. Thanks for responding, however would it be possible to email as opposed to constantly having to comment? Haha shoot me an email when you get the chance there’s a few more questions I have. I do like to keep the comments on topic as much as possible so yes you can certainly email me if you have other questions. The best way is to use the Contact page at the top of the website. If you would like ongoing communication or have lots of in-depth questions, I do offer a priority email service for a small fee, where I have a 24 hour response rate and can generally give more detailed answers. Awesome story bro. I think you’ve done a good job to get Emma noticed and treat her like you would meet normal girls. She sounds like a really nice person to talk to. I hope you get a second chance of talking to her again;through her phone number. Thanks for reading and commenting. I like your interpretation and views on the story. First of all I want to say you are an absolute legend! Awesome story and a real shame that dude messed it up so bad. Did you call or text her at all? I think the fact you didn’t worship her for being famous made you look a lot cooler than most people she meets. I’ve met models and some not so well known celebs before and the moment they think they are better than you you are never going to win. What would you do if you met a celebrity like Emma Watson in a less ideal environment like at a movie premiere or rushing down the street or something? Your observations with models and other celebrities do hold some truth, even if they are generalisations. It is not simply whether a woman thinks they are ‘better’ than you that will determine how she reacts; that depends on their ego and self-image. What is more important is whether they believe YOU think you are on the same level of social value. If you carry yourself with confidence and high self-esteem, it doesn’t matter as much what your comparative background is. In the above story, not being impressed with Emma Watson JUST because she is famous is most certainly what set me apart from most of the ‘ordinary’ people she meets. This applies for notably attractive women too: not being impressed simply because they are physically attractive, prior to getting to know them. As for your final question, the setting does play a part in how smooth the interaction is likely to go. For the two examples you mention you obviously won’t have as much time to make a good impression and build any rapport. The best bet is to try and engage them with something quick and fun that builds attraction and intrigue quickly. I devised a bunch of interactive games that can be done quickly or from a distance to grab someone’s attention that would probably work well here. This is all theoretical of course as I have never personally approached a celebrity in either of the settings you mention. Since you met her, could you tell how tall she looked to you (considering heels of course)? I ask you because my cousin’s friend who lives in Crawley (near London) said he saw her passing by and she was beautiful even if without make up, but so shocking-tiny and petite… not 5 ft 5in as she reported, but 5’2-5’3, 5’4 on a good day. Possible? I don’t recall her being noticeably tall or short; I am guessing she is about 5 foot 5 inches in height. I can’t remember if she was wearing high-heels but it was a Sunday evening and everyone was dressed fairly casually, so I don’t think that she was. Crap… I can’t even believe how lucky you were meet her. If I were you, I would have stabbed that Craig guy as soon as he appeared with the note. With or without anything to stab him with, he would have been stabbed. Let me ask you something really important. Are you the new guy that is dating Emma Watson? Okay Ruben let’s use a little common sense…. His name is Sam, not Will! I wasn’t aware that she was dating anyone new, which should answer your question Ruben. After some extensive research (a quick Google search) it seems that John is correct about the new fellow being called Will. It also seems that he is an unknown, normal guy, which for some reason makes me smile and reinforces how she came across to me. Normal Guy… Not for nothin but she deserves more than just “a normal guy”! At least I think so. The reason being normal guys are all the same inside of a year! They go above and beyond for the first three to five months, then they started to feel like their man card has been revoked! Right around the seven month mark the true colors begin to show and they spend the next three “fighting to make it work”! After all that they either break up and “remain friends” (which never lasts) or they’ll break up and get back together once or twice than that’ll be it, one will get sick of the other and they’ll both move on. In my opinion he’s a rebound from Johnny, not saying hes (Johnny) is the better of the two, or that either is better than the other, just simply stating my opinion on the matter. But as long as she’s happy….. Without personally knowing anything about the men in question, it is difficult to accurately analyse. Celebrities tend to gravitate towards other celebrities due to several factors: opportunity, understanding their world and having a disproportionate amount of social value bestowed upon them by the general public. From my limited experience of meeting Emma, she seemed a lot more grounded than other celebrities. Attending University and generally avoiding common, celebrity pitfalls backs this up. All of this does not negate the fact that “normal” people can still possess equally attractive traits as celebrities. After all, attraction is a belief system more than anything else. Oh, sorry. I thought you were someone who is engaged with Emma somehow. I saw in a source sit ethat his codename is called ‘Will Adamovich’ Then I watched a video on YouTube about a fanboy going on a date with her. He goes into her hotel with flowers and the guy looks exactly like Will Adamovich. It read in the description that his name is Sam and I wondered if that is his real name. So I thought it could b eyou, but I was wrong. Moving in together – Tips for living with your girlfriend or boyfrien... There is no such thing as the perfect partner… or is there?